If you're having trouble getting in and out of your tub or shower because of mobility or other health issues, a walk-in tub-shower combomay be just what you need. You won't have to rely on someone else when it comes to your hygiene. When you decide to purchase a walk-in tub-shower, you'll be overwhelmed with the choices. 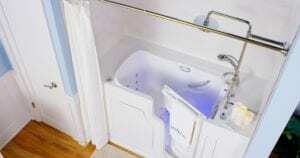 You may hear some things about tub-shower combos which give you cause for concern. Many of the things you'll hear are myths and can be debunked by a little research. You may have heard water will leak through the door of the tub-shower combo. Manufacturers have features that keep the door from allowing water to seep out of the tub. Most tub doors open inward, decreasing the chance the door can open accidentally. The door has a locking handle. You may have been told it takes a long time for the tub to fill and that you'll freeze while you're waiting for the tub to fill with warm water. Some walk-in tub-showers fill quicker than others, and you can get a tub with an ADA-compliant rapid-fill faucet. While waiting for the tub to fill, you'll be enjoying a heated back and seat, so you won't get too chilly. You may have heard it takes a long time for the walk-in tub-shower to drain. Your tub-shower combo may take more water than other tubs, but you can get a quick-release drain to speed up the process. There's a built-in towel rack, so you can start drying off while the tub drains. You may hear that a walk-in tub with a shower is hard to get in and out of. If true, this would be a big problem since easy access is a big advantage of the walk-in tub-shower combo. Built-in features make getting in and out of the walk-in tub-shower easy and safe. When you stand, there's an anti-slip surface. You can use built-in grab bars to help you get up and balance yourself. The step to enter or exit the tub is low. You may hear that you can't find a walk-in tub-shower that is ADA-compliant. Find a company that will install the walk-in tub-shower combination. A reputable company will know the ADA standards. For example, you'll get an ADA-compliant built-in seat, safety bar, and anti-slip floor. You may hear that walk-in tub-shower combos are hard to clean. A walk-in tub-shower is not any harder to clean than any other tub or shower. You'll need to take extra care to make sure the jets stay clean. The mold-resistant gel-coating is helpful. The hand-held shower wand is useful when cleaning the tub-shower. You may have heard Medicare will not help with the cost of your walk-in tub-shower combo. This is true even if you're getting the tub for medical reasons. Check with your state to see if Medicaid will cover any of the costs. Consult with a tax professional to see if you can deduct the cost of materials and installation on your taxes. If you're having difficulty stepping into a tub or fear for your safety while bathing or showering, call Safe Step Walk-In Tub Company. 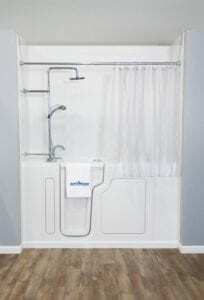 Made in the USA, a walk-in tub-shower will help you regain and keep your independence as long as possible. Schedule a free consultation today.